I just got this email from President Obama – he drops me a note on occasion (well, I’m on his mailing list :) – on the loss of Ted Kennedy. What a legacy that Kennedy family has left us. With text by Martin Luther King Jr.
Here’s a short film I did called "Lanterns of Memory" about this day, August 6, sixty-four years ago, when we dropped the Atomic bomb on HIroshima. This film became part of my feature documentary about my journey to the ground zero’s of the world, Scared Sacred. “We’ve raised gluttony to a whole new level with consumerism and greed is a quest for the infinite in the wrong place – the human soul yearns for the infinite and in terms of stuffing ourselves or our closets or what have you with goodies, it doesn’t work. Pretty soon you have to buy a new house with bigger closets – I saw a statistic recently about how many Americans have storage spaces for their stuff –so they not only have houses with their closets for their stuff they also have these storage spaces – stuff on top of stuff on top of stuff. So simplicity has something to do with saying no to the addiction of consumerism. That has tremendous implications. The American economic system as I understand it, 80 percent of it runs on consumerism, so that means that if we could cut back drastically on the consumer addiction, and that’s what it is, gluttony, it’s the gluttony of consumerism, we could release our economic system so it could serve more important services than just for filling our closets and stuffing our bodies. Which purposes of course a world that works for everybody and economics that works for everybody. And if we had an economics that works for everybody, we wouldn’t have wars. At least we’d have far fewer wars – we wouldn’t have envy, and we wouldn’t have a lot of things that are still running the human enterprise. Greed is real – it’s a spiritual addiction and the fact is, it’s becoming reincarnated and blessed by the raining economic ideology and we do have to stand up to that. Part of the struggle is one’s own lifestyle, what one can do to live more simply and um, and part of it is thinking differently, like Franklin D. said, don’t change the world, change worlds. By that I think he said, change the way you see the world, the perspective on the world. As we learn to think more interdependently and realize that um, Americans who comprise 4 percent of the worlds population are using about 25-30 percent of the worlds energy, where’s the balance there and how long can that persist, go on. What’s God Have to Do With It? I recently gave a talk at the Ryerson United Church, a place renouned for it’s progressive congregation. 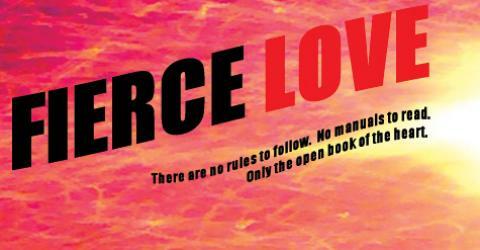 Although I am not a Christian, I dig Jesus Christ – He was most definitely a Fierce Love revolutionary. However, I am deeply saddened by the atrocities that have been committed in His name. Even yesterday, a doctor was murdered by a fundamentalist Christian. Can you imagine JC killing someone who disagreed with him? I don’t think so. But a tremendous amount of good has also been done in the name of the Prince of Peace, and I’ll take goodness wherever I can find it. We need people of all walks of life, of all faiths, and non-faiths, to come together now, and work towards a future of harmony and sustainability. The time for division, for us and them – ing, has come to an end. It’s time for unity. Which does not mean sameness! Unity is strengthened by diversity. I actually quite enjoyed talking to a congregation of spiritually focused, socially conscious people, even if most of the rituals didn’t have a resonance for me. Because I felt an authentic celebration of community, an authentic celebration of Love, and an authentic love of God. I don’t use the G word that often, because it has been so abused and confused and misused in todays society. Some would prefer to just skip it altogether. When I do use it, I tend to write “G~d,” because that leaves some of the mystery intact. G~d is not an old man with a white beard sitting on a cloud. G~d is not mean, judgmental or short tempered. G~d is not a human being, with all our limitations and emotions. But G~d is something I sense, I feel, I Know, and I value. G~d offers me a sense of higher meaning – G~d for me is the totalility of all that is, was and ever will be, the “I Am” that shines behind the small me, the vast Field that connects everything, and the sum total of those connections. The source of it all. I communicate with G~d all the time, and in fact, when I’m running a little ragged, when I’m pushing myself a little too hard, all I need to do to recharge deeply is to pause for a breath or two, center myself, and invite the divine in. Reconnect with my highest calling, my highest motivation, the source. My understanding is rooted in a direct connection, a direct Knowing, or “gnosis.” It is not something I have read about or heard about, or speculate about. It is intrinsic to who I am, a constant wellspring of Love that brings meaning, celebration, and endless reservoirs of positive energy to my life. For me, G~d is the life force herself, G~d is Love herself. It felt good to say God. It’s a word that has to be reclaimed from all who misuse it, from the George Bush’s and the Jimmy Swaggerts, from the Jihadists and the fundamentalists of every creed. But a relationship with G~d is not for everyone, and is not a necessary part of spirituality. You can get by fine without it – there are other ways to find meaning. The debate over the “existence of G~d” can become a smokescreen and an energy sucking diversion, and for that reason, I don’t engage in the debate. It’s enough just to Love- yourself, each other, and this planet. If we could just start from there, everything else will fall into place. In the face of a world in crisis, I dare to care. In the face of materialism, consumerism, and me me me – ism, I recognize that I am because you are, that without you and you and you – plant animal mineral macro micro organism human- I would not exist. That we are all part of a brilliant multi hued tapestry, that we all add to the warp and weave and woof, that we all have a fierce light. In the face of irony, cynicism, jadedness and despair, I choose hope. In the face of narrow empiricism, the confining corridors of quantification, of dogma of any stripe-rational, political, spiritual or religious, I choose to light a match to the fuse of possibility, and blow up all boxes, sending the church of reason, the church of ideology, the church of churchiness, into the air, with a deep and satisfying boooooom, so that emptied of their arrogance, these churches might offer us freedom, not more walls, love, not more hate, understanding, not more separation. In the face of hatred, anger and fear, I choose love, compassion, and celebration. If I can’t party in your revolution, don’t put me on the guest list. In the face of my own vulnerabilities and limitations, I choose to go easy on myself. I am not perfect, I am human, and that is a wonderful thing. My stumblings and fumblings make me real. I am simply doing my best. What is a Spiritual Progressive? Fierce Light Visionary Van Jones speaking at the founding conference of the Network of Spiritual Progressives. We in the NSP (Network of Spiritual Progressives) use the word “spiritual” to include all those whose deepest values lead them to challenge the ethos of selfishness and materialism that has led people into a frantic search for money and power and away from a life that places love, kindness, generosity, peace, non-violence, social justice, awe and wonder at the grandeur of creation, thanksgiving, humility and joy at the center of our lives. So we include in our meaning of “spiritual” all dimensions of life that cannot fit into a scientistic or narrowly empiricist frame. We reject the notion that all that is real or all that can be known is that which can be subject to emprirical justifiction or can be measured. On the contrary, we know that love, kindngess, generosity, awe and wonder, art, ethics, and music are just some of the obvious parts of life that cannot be understood or adequately captured by scientism and which we value. We call those aspects spiritual. So it’s easy to understand that someone can be spiritual and yet not be particularly interested in most existing conceptions of God or religion. Of course, there are many others, including some of the founders and leaders of the NSP (but not by any means all of them) who do find their spiritual nourishment in their relationship to God or their religious tradition, and they too are part of our community. But there is a huge problem when social change movements stay away from anything that calls itself spiritual. We believe that many of the secular movements that exist in the world today actually have deep spiritual underpinnings, but often they are themselves unaware of those foundations, unable or unwilling to articulate them and sometimes even holding a knee-jerk antagonism to explicit spiritual or religious language. This antagonism limits their effectiveness, though it derives from legitimate anger at the way that the language of spirituality and religion has been sometimes used to justify war, oppression, sexism, racism, homophobia, ecological indifference, or insensitivity to the suffering of the poor and the homeless of the world. Solidarity means that we affirm our responsibility towards each other within our families, within our nation, and within our spiritual/religious community–and also beyond the narrow boundaries of ethnicity, religion, and geography. We affirm the obligation to actively resist injustice and refuse to take part in it even when we can’t prove that our resistance will produce change. In solidarity with the oppressed, we wish to see the democratization of economic and political institutions and a redistribution of wealth so that all people can share equally and sustainably in the benefits of the planet. At the same time, we will challenge the lack of a spiritual dimension in the agendas of our allies in progressive social change movements. That gap has allowed the Right to present itself as the force that cares about spiritual issues. And the Left’s failure to address spirituality has led many to believe their hunger for a larger framework of meaning and purpose must be separated from their involvement with social transformation. Social change activity gets focused on a narrow political agenda that lacks the depth that can inspire sustained commitment or nourishing involvement. Imagine an international group of people who would see themselves as allies to each other in advancing this way of thinking, people who are unashamedly utopian and willing to fight for their highest ideals, yet unashamedly humble in knowing that we don’t know all that we need to know to do the healing that needs to be done. Imagine that this group would help each other in our individual as well as group activities, affirming what is good and brainstorming with us about how to create a movement that gives equal priority to our inner lives and to social justice, that takes loving and caring as serious goals for social healing, and that rejects the utilitarian and materialistic assumptions of the contemporary world and actively fosters awe and wonder in its participants. Imagine that you could be part of creating that.